Go White Sox! Go Polish with! Murdo and I started dating in November of 2004. I remember this because it was the year before the Chicago White Sox won the World Series. Weird way to remember an anniversary, you say? Not when you're engaged to Murdo. You see, in the beginning, I knew he had his little quirks and his mini-obsessions -- things like eating cookies and milk for breakfast every day and a having a close bond with his modified X-Box. But because we started dating in the off-season, I had yet to learn what kind of Sox fan he was. I should've known, really. The fact that he wore a different Sox shirt every day might've tipped me off. During the first few months, he'd casually mention how he couldn't wait for baseball season to start. I'd brush it off and think to myself that baseball is the most boring sport on earth to watch, right up there with golf and slug-racing. I might have said this out loud one day, to which he probably replied with an appalled, "What?! Baseball is the best sport EVER!" or something like that, then proceeded to go on about strategy and precision and whatever else makes baseball the best sport EVER. Because Murdo is the kind of Sox fan who keeps a game schedule in his wallet, his car, and on the fridge. The kind of Sox fan who had not one, but two Ribbie dolls growing up (Ribbie is the pink mascot below, on the right. The anteater, in case you were wondering.). If I had been a Cubs fan, we probably wouldn't be getting married. Yeah, it's like that. So come April 2005, I watched a lot of baseball. I fell asleep during many extra innings, I remembered the names of players and quickly developed favorites (Iguchi, the Asian, of course), I even learned what a double play is and what RBI stands for (run batted in, thank you very much). OK, so maybe baseball isn't so bad. And it helped that the White Sox were really, really good that year. 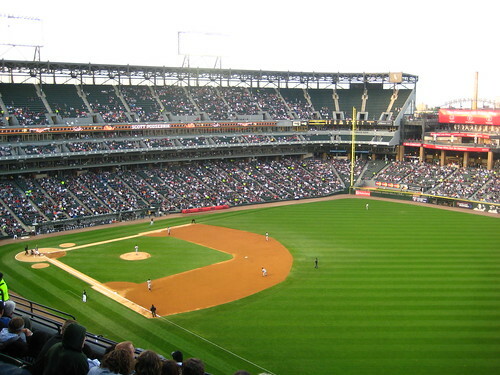 Then Murdo took me to a game at U.S. Cellular field. And I had my first Polish sausage with. (With onions, that is. Murdo was sure to tell me how to order my sausage: Just say Polish with. And don't add ketchup.) 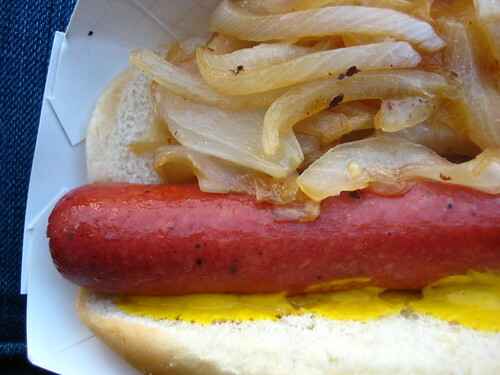 And if the thrill of the 2005 White Sox Championship season didn't completely convert me from baseball-hater to White Sox-lovah, that Polish sausage certainly did. 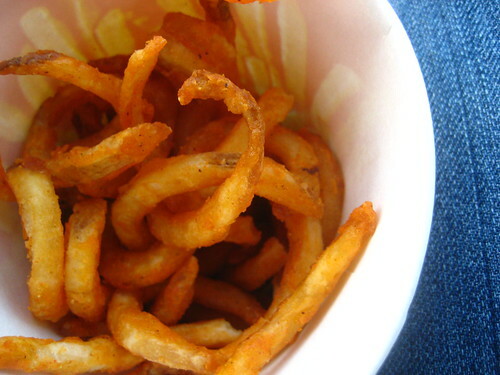 I soon discovered the curly fries, as well, and can I tell you a secret? I might call myself somewhat of a Sox fan now, but I'm just doing it for the food. Aw, just kidding. Kind of. Hey, at least I don't like the Cubs. That's something, right? That's awesome. Loved reading this. In fact, I read it out loud to my coworker. Yeah. 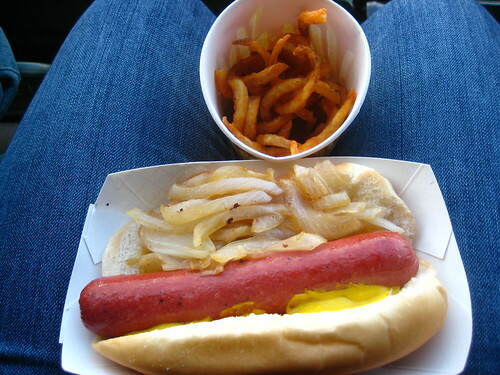 I'm a fan of people who go to baseball games for the food. So get that. You need to watch Fever Pitch, I think you'd appreciate it! I made Terry read your post since he too loves food and baseball. His only response to your last line was "Boooo! GO CUBS!" jenny - haha i figured i'd get a few of those from cubs fans. and i've seen that movie -- he's not THAT bad! hector - get thee to u.s. cellular field and eat one! Homemade pear pancakes are very nice. Lunch at Barbara's Fishtrap in Half Moon Bay. Dinner at Chez Panisse Cafe. Rock Bottom, and I'll see ya later.